We offer a post-doctoral research contract of 12 months (renewable for other 12 months) in behavioural ecology, starting between October and December 2012. 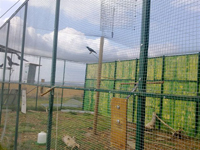 The position will be held at the University of Valladolid, Department of Agroforestry (Spain) in collaboration with the University of Oviedo (Research Unit of Biodiversity; UO-CSIC) to investigate cooperative behaviour, sociality and communication in a captive colony of carrion crows. Our main lines of investigation address individual and social factors promoting cooperation, reciprocity and communication in the carrion crow, a bird species characterized by an extreme plasticity in social and reproductive behaviour, from social monogamy and weak territoriality to kin-based social living, cooperative breeding and strong territorial behaviour. The aims of our current projects are to investigate sociality, cooperation and reciprocity outside the context of reproduction, using captive crows as study subjects. Besides the current research lines, the candidate will propose and develop his/her own ideas and will help supervising one-two PhD students. -	A captive colony of 11 well habituated carrion crows of both sexes, comprising 4 pairs of siblings and 3 unrelated individuals. It will be possible to increase the colony. Our birds are housed in a spacious, outdoors aviary divided into 4 main compartments (12 x 6 mt each) plus 8 experimental compartments (3 x3 m each) visually isolated from each other. Working with our crows (both in the field and in the aviaries) is a relatively safe experience. The geographic area poses no risks in terms of dangerous or poisonous wildlife, infectious diseases or criminality, and our work does not involve intrinsically dangerous activities. The only hazard is represented by a reduced number of zoonosis that are common to people living in contact with animals (including domestic pets) and that can be easily prevented by adopting a few simple precautions. Here you can download our risk assessment and safety protocol. All students and volunteers working with us must read it and return it signed.